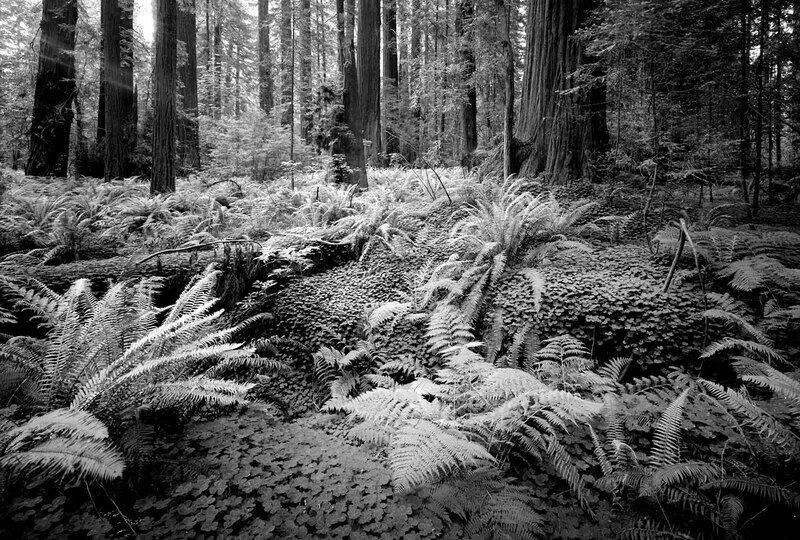 Photographic Story When planning our trip out west to celebrate our 50th Wedding Anniversary, The Avenue of the Giants – Humboldt Redwood Forest State Park – was a must on our list. During our young marriage we spent a lot of time in this redwood forest and came to love the place. It was here that we felt the ancient spirit of life; it was here that I hugged my first tree and found a wonderful appreciation of those who came before me. I respect and admire those who worked so hard to save this forest…those who could see the life that was to come and saved this beautiful part of our earth so I could enjoy it. We have had a lot of wonderful experiences here. Whenever we’re in California, we try to make it back to this place that feels like a spiritual home. Analog – Archival Silver Gelatin Photograph Clyde’s silver gelatin black and white images are created using an 8” x 10”, 11” x 14”, or 12” x 20” view camera. Clyde prints his images in his own darkroom on fiber-base paper in a limited edition. The photographs are selenium toned, then mounted and matted to current archival standards. His images come in sizes from 8” x 10” inches to 5’x 8’ feet. His love of art and nature is seen in the exceptional detail and more subtle textures of his photography. Each photograph is individually hand printed in the darkroom and will vary based on factors such as artist preference, chemistry and temperature. The image displayed on the website is a digital scan of the original negative and should be considered a representation of the printed version of the art.